OTTAWA -- The Senate's ethics officer is being asked to investigate the role of the Conservative party's chief fundraiser in the alleged cover-up of Sen. Mike Duffy's dubious expense claims. Liberal Sen. Celine Hervieux-Payette wrote Lyse Ricard on Thursday, asking her to look into the actions of Conservative Sen. Irving Gerstein. The self-described Tory bagman allegedly agreed to use party funds to reimburse Duffy for paying back his disputed living expenses, according to RCMP documents filed in court last month. Gerstein eventually balked when the tab rose to more than $90,000 -- a sum paid ultimately by Prime Minister Stephen Harper's then chief of staff, Nigel Wright. Gerstein has confirmed he did dip into the Tory till to reimburse Duffy for $13,000 in legal fees. At Wright's behest, Gerstein also allegedly contacted Deloitte managing partner Michael Runia in a bid to ensure the audit of Duffy's expenses would make no finding as to whether his primary residence was his longtime home in Ottawa or his cottage in Prince Edward Island, the province he was appointed to represent. In her letter to Ricard, Hervieux-Payette says Gerstein appears to have violated the upper house's conflict of interest code by interfering in the work of the Senate's internal economy committee, which had ordered the audit, in order to promote Duffy's financial interests. In June, Ricard suspended an investigation into the Wright-Duffy deal after the Senate referred the matter to the Mounties. However, Hervieux-Payette said there's no reason for the ethics watchdog to steer clear of Gerstein's role in the affair. 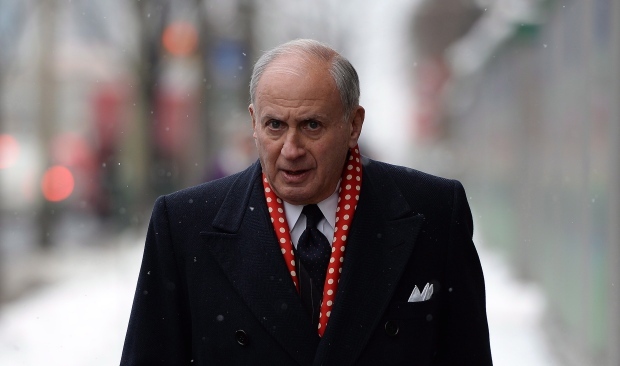 "We have no indication whatsoever that Sen. Gerstein is being investigated by the RCMP," she said in an interview, adding that he is so far only a witness who's been questioned by the Mounties as part of their investigation into Wright and Duffy. The Conservatives have used their majority in the Senate to thwart several previous efforts by the Liberals to get Gerstein and Runia, who audits the Conservative party's books, to testify about their role in the affair. "This is the last recourse that I have," Hervieux-Payette said of her request to Ricard. The internal economy committee has heard from Gary Timm, the lead Deloitte auditor on the Duffy file, and two other members of his team. Timm confirmed Runia called him during the audit to inquire about how much Duffy owed in invalid expenses. He insisted he shared no information with Runia and that the integrity of the confidential audit was not compromised.